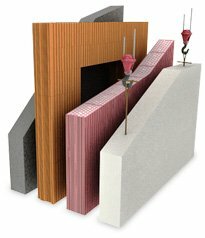 Approximately 16 years ago Redblocsystems developed the trend-setting redbloc technology for production of prefabricated wall elements made of mineralic building materials and makes it available in the form of licenses. The wall elements can be made to measure industrially from brick, sand-lime brick, cellular concrete, concrete block and other solid building materials. All special shapes, such as sloping roof elements, installation ducts, openings for windows and doors, are manufactured fully automatically. The redbloc system combines the outstanding advantages of solid construction in terms of living quality, sustainability, thermal and sound insulation with the increase in efficiency of prefabricated construction method. Redblocsystems GmbH offers turnkey, fully- and semi-automatic production lines for the prefabrication of wall elements. Our company holds the necessary building authority approvals and offers its know-how within the scope of granting licenses. We develop an optimal system design for our licensees and support them during start-up and market entry.